Fulfill your feline tastes with the Kate Spade New York® Cat's Meow Cat Medium Bella Pouch. Zipper pouch made of 100% genuine, crosshatch leather. Top zip closure with wristlet attachment. Fun cat silhouette decorated with 3-D ears and gold-tone whiskers. Brand name and floating spade logo. Custom woven Bookstripe on Poly Twill interior lining features back-wall slide compartment for easy, secure storage. 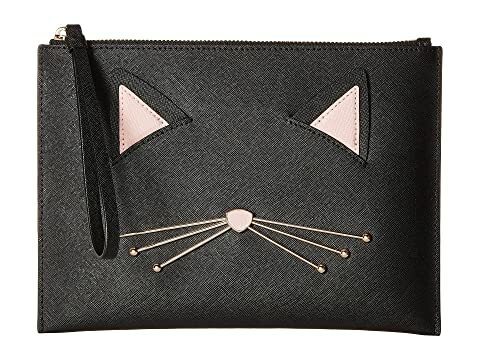 We can't currently find any similar items for the Cat's Meow Cat Medium Bella Pouch by Kate Spade New York. Sorry!